Ntv7 will be celebrating its sweet sixteen birthday on 2014. This will be another major milestone for the TV station. In order to stay relevant and fresh, Ntv7 has planned outstanding line-ups of some of the finest programmes for this coming year. Positioned as a premium brand that targets the Modern Urban Progressive Adults (MUPAs). Malaysia’s preferred channel by securing prime positions amongst its competitors. Top 4 most-watched channel amongst the Urban 25+ and Chinese 4+ viewers in the country. “Turning 15 this year is exceptionally amazing for ntv7 as a number of bold initiatives including Bella Awards – the nation’s 1st women’s awards show, are spearheaded by the channel, while making into The Malaysia Book of Records for the largest gathering of pregnant women through its ‘Bella Bundle of Joy’ baby shower event,” said the Group General Manager of ntv7 & 8TV Airin Zainul. 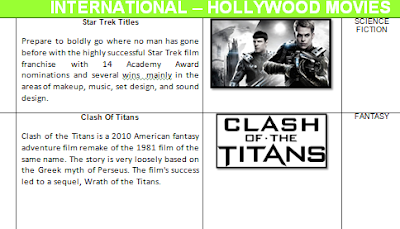 “We are looking forward to celebrate our 16th anniversary in 2014 with an amazing line-up of new and returning programmes for our faithful viewers – made up of quality Hollywood titles, riveting local dramas, prestigious award shows, inspiring women-centered programmes and many more,” Airin added. In this coming year, we will see the return of TWO OF MALAYSIA’S PRESTIGIOUS AWARD SHOWS on ntv7 – Golden Awards and Bella Awards – in its 3rd and 2nd year respectively. 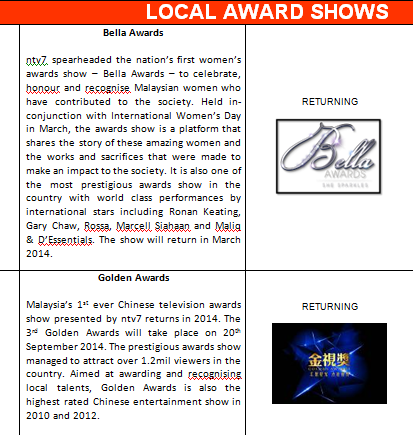 Apart from these award shows on the local front, ntv7 will also feature a number of LOCALLY PRODUCED TITLES including Penang Striker (a story on football, history and love set in the 1920s), Project Earth (a charity-based magazine show that sends people around the world to contribute and help the poor and needy), and Kids Dancing (a reality dance competition for children). 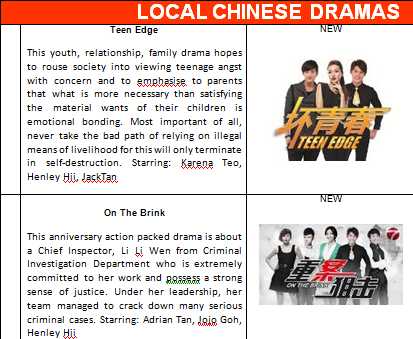 Ntv7 has also invested in new exciting LOCAL CHINESE DRAMAS in 2014 including On The Brink (an action-packed crime investigation drama scheduled to air on Q3 of next year to celebrate the station’s 16th anniversary, starring Adrian Tan, Jojo Goh, Henley Hii), Teen Edge (a moral-driven show targeted at the youths starring Henley Hii, Karena Teo and Jack Tan), and The Scavenger (an intense psychological suspense drama starring Kyo Chen, Jeffrey Cheng and Karena Teo). Viewers can expect yet another ground-breaking CHINESE NEW YEAR TELEMOVIE by ntv7 next year featuring its Top 10 artistes, entitled, “Spring Chorus”. Meanwhile, hollywood series fans can also expect some POPULAR HOLLYWOOD HIT SERIES to be aired on Ntv7 with a good mix of returning titles such as Once Upon A Time (Season 3), The Mentalist (Season 5), Fringe (Season 5), New Girl (Season 2), and How I Met Your Mother (Season 8). New exhilarating series will be featured too including Once Upon A Time In Wonderland (a spinoff of Once Upon A Time), Blacklist, Sleepy Hollow, Witches Of East End, The Michael J. Fox Show, and The Crazy Ones. Ntv7 will also showcase a number of Asian titles comprising of the ever popular HONG KONG TVB DRAMAS. 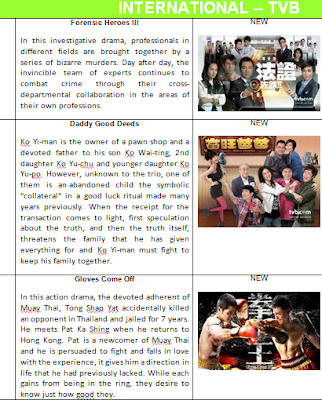 Amongst the strong titles that will be aired are Daddy Good Deeds, Forensic Heroes III (starring award-winning actor Wayne Lai and the beautiful Maggie Cheung), Gloves Come Off, Highs And Lows, Inbound Troubles (featured in the New York Times), The Last Steep Ascent, and Three Kingdom RPG. Highly successful drama series from China entitled, Empress In The Palace will also be premiered first on free-to-air channel, ntv7, featuring show stars Sun Li, Chen Jian Bin, Ada Choi and Leanne Liu. FAVOURITE INTERNATIONAL CHINESE REALITY SERIES – Chinese Dream and Perfect Match – will return with the latest seasons on the channel. This will definitely thrill the viewers! Fans of LOCAL CHINESE REALITY SERIES will find more reasons to rejoice as a number of familiar titles will return on the Home of Feel Good including Aunty Must Go Crazy (Season 3), Foodie Blogger (Season 2), Listen To The World (Season 2), Mandarin Battle Star (Season 5), Women’s Zone (Season 6), and All About Sports (Season 2). 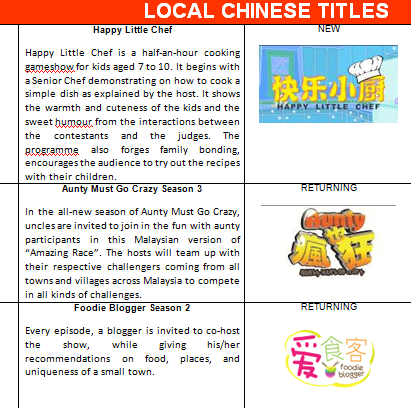 Besides these highly-anticipated returning titles, a new and refreshing cooking game show – Happy Little Chef – will be introduced to kids aged 7 to 10. The feel good channel will also be offering new and returning KIDS’ PROGRAMMES for the creative young minds such as Hikayat Tok , Wakfu, Kindaichi’s Case File, Sabrina: Secrets Of A Teenage Witch, Kungfu Panda (Season 2), Dragon Ball Kai Z (Season 2), and many more to come.